DNG TormeyLee have the pleasure of introducing this four bedroom detached property to the market. 33 Hollystown Demesne is ideally located in the sylvan setting of Hollystown adjacent to Hollystown Golf Club and close to the village. This stunning detached property would make the perfect family home as there is an abundance of generous light filled living space to meet the demands of modern living. Well presented with a high quality finish this property is sure to appeal to the discerning purchaser. Accommodation comprises of four bedrooms, master en-suite & walk in wardrobe, living room, TV room, open plan kitchen/dining/living area, utility room, guest WC, extra room to the rear of the property, family bathroom and an enclosed rear garden. 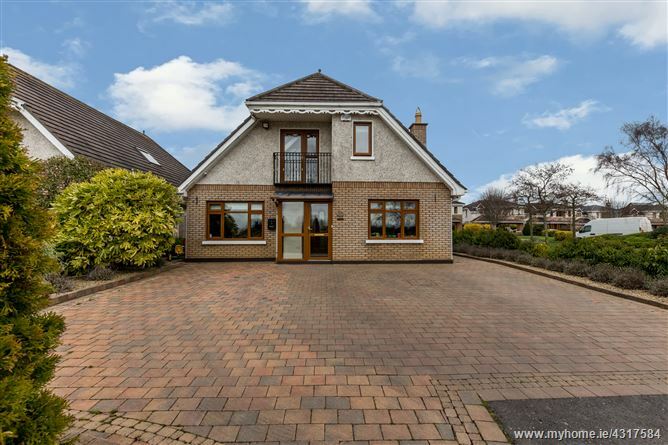 Features of this property are plentiful and include a JD fitted kitchen, granite work surfaces, stair way to a third level walk in wardrobe in master bedroom, beautiful views of Hollystown Golf Course, bright modern décor, under floor heating in the open plan kitchen/dining/living area and much more. The beautiful enclosed rear garden offers a putting green, limestone patio, pergola with lighting and a large shed.